THE CANADIAN PRESS — BRAMPTON, Ont. - It should come as no surprise the United States is having a hard time dealing with a mammoth debt crisis that is threatening to push the world's largest economy over the fiscal edge, Prime Minister Stephen Harper said Wednesday. 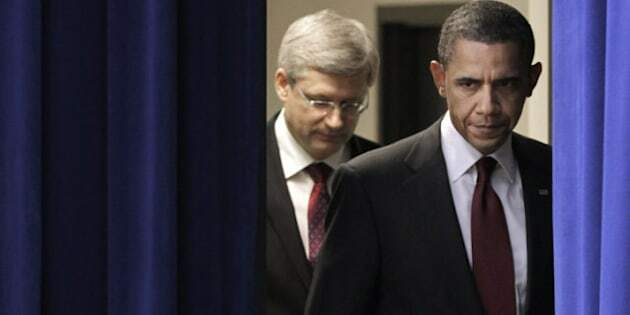 At the same time, Mr. Harper said, Ottawa was confident the government of U.S. President Barack Obama would find a way to deal with the situation and avert an economic disaster. “Part of the reason that the Americans are having such trouble dealing with this is that the U.S. debt and fiscal situation is extremely difficult,” Mr. Harper said. Speaking after a Korean War memorial ceremony, Mr. Harper said the American political process for tackling the problem is “difficult” at the best of times. “The United States faces very difficult choices,” he said. He called the situation in Canada “significantly” better than that south of the border but said the government in Ottawa would remain vigilant and act as needed to mitigate any spillover effects. “This government is committed to taking the necessary actions, some difficult actions, over the next couple of years to ensure that we stay on track, that we balance our budget and we don't see anything like the kind of situation that we have in the United States,” Mr. Harper said.